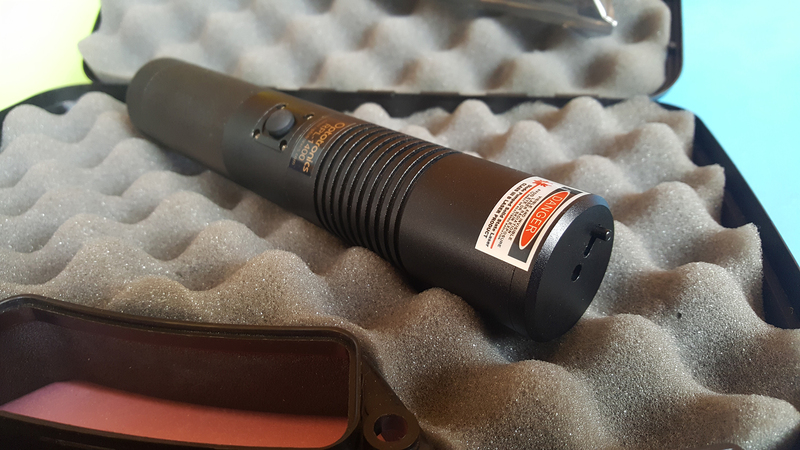 Looking forward to see some beamshots of your new green friend! He must be working on a nice review taking this much time! I don't care, give us a short review with beam shots! Gimmie! I like the divergence at power from DPSS, but you are correct there is far more to a beam than that. 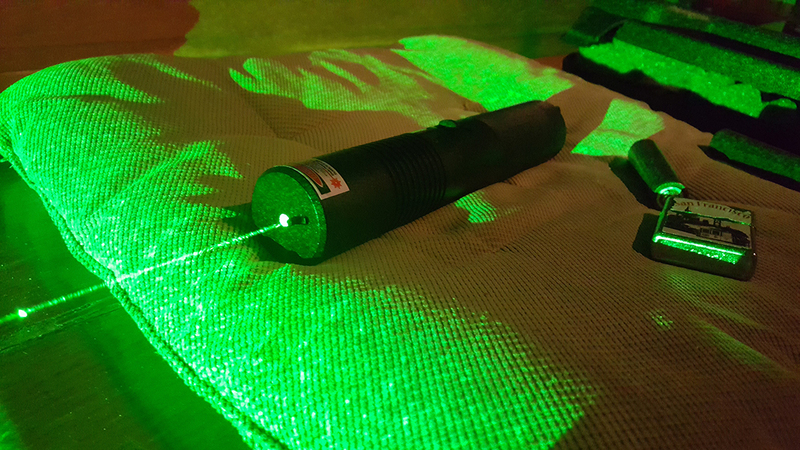 You guys know that since radim is working on this it will be a great review, with all kinds of laser p0rn to make us all drool all over ourselves! Yup. I'm spoiled by nice nice profile of a 532nm dpss. Don't care for battery operated lasers that project a rectangle or line. I hope it proves to be a good quality DPSS beam. From all accounts it should be. I keep checking in to see if there is any word from Radim about it --wanting to hear if it is as he expected. Radim, where are you? Everyone wants to hear something about your new RPL II. Oh, these posts guys... :drool: Allright, I do not want to make her Mrs.Columbo. First of all sorry to keep you waiting. 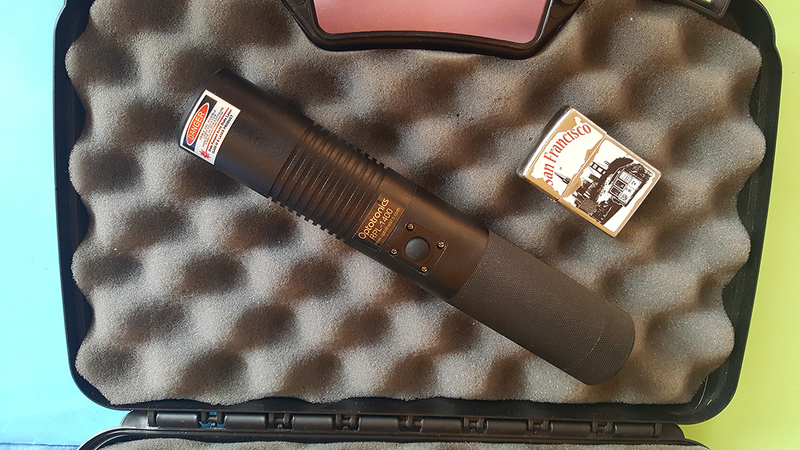 Not working on review yet, I cannot as there would be just kind of "this is the great laser, this is the beast..." - therefore not much value as I need to get some user experience with her. Whatever I think some first impressions are appropriate to write here. Also I (luckily) did not burnt my house down, to be honest it would not been that difficult with her. Ok, let's stop the conspiracy... I owe you a "short" explanation - if not interested, please skip the following paragraph. Awesome, this is something from the other world... I have no words. I did "glare" test, when dot hits closed corner of nearby building in our property. The point is to get the glare around to estimate the amount of light getting back to me to be captured by camera during laserpainting - it illuminated EVERYTHING brightly. Much brighter than my 3.5 W blue. Even the moon was shining the glare was enormous. Exactly this is what I missed during laserpainting. I did also several cigarette light up tests - simply instantly. Even the temperature was around 25 degrees Celsius and it is recommended not run it more than 30 seconds due to heat generated (30 seconds is the rest time - so 50 % duty cycle), I did not observed any temperature change on the host. Due to large and heavy metal of the heatsink it seems to be very effective. It surprised me a lot. Short note - I think all aliens just made no fly zone around our planet and Solar system, as I shined it (very carefully) on sky. So, you are safe for now. I also tried dazzler function - if you hold button pressed it starts to flash rapidly. Since it was quite late and I was tired, I did did not do the beam shots so far. Working day, I finished the model and presentation and did trial of the presentation I mentioned above (the paragraph which I recommended to skip if you were too curious for the beast). 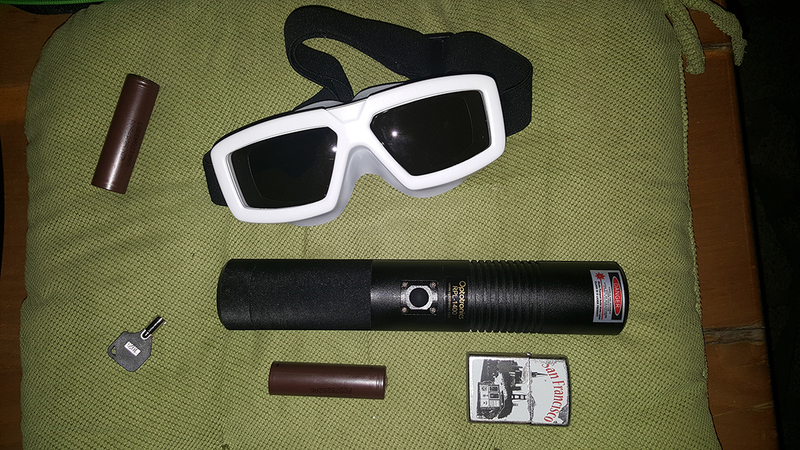 After I left my workplace I wanted to do ride in the forest and some beamshots – the laser is of enormous power and especially with these beam specs the energy density is incredible and it takes special precautions for using it for beamshots, so I wanted to think about how I’ll do it. It is definitely nothing for beginners. So I wanted to take a short ride and after that to prepare everything for the beam shots. Unfortunately when I came home our cat just „came“ to me and my sister and he was injured on his left front leg. Plans changed and we took him to vet. After we returned it was after a rain I did a short ride in the forest, to clear my head a bit and after return I pulled the laser out of its case again. 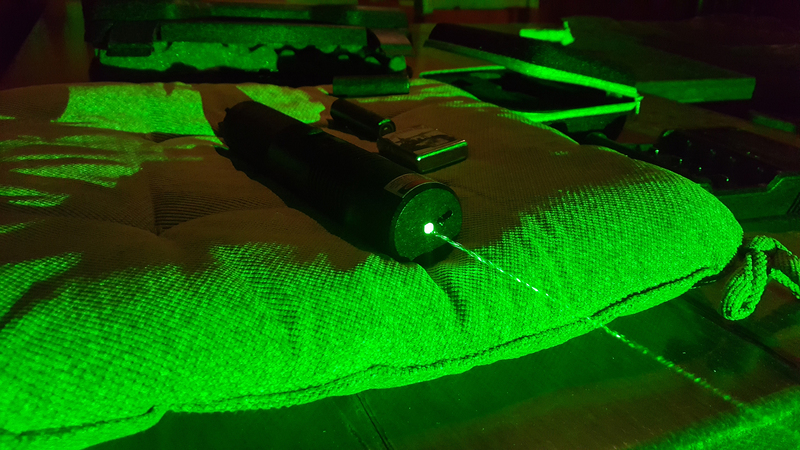 As I was not able to prepare it for full outdoor beam shots I took it in our garden house, where I was able to get controlled conditions. I pointed it on white wall like 2.something meters away and took with my mobile what you can see below. The illumination was just a light bulb and THE BEAST. 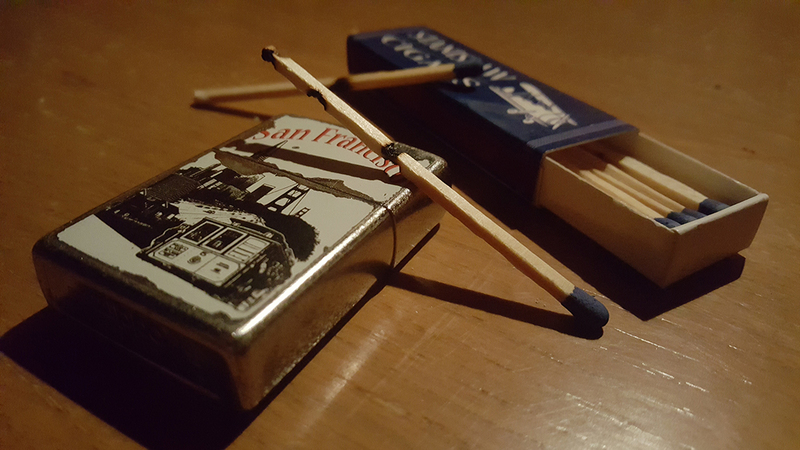 For comparsion of how big it is I left there my Zippo and some batts in various positions. I also did further tests – especially burning to learn what I can afford with it. It burns everything in seconds! I did not took dot shot as I was worried about my mobile camera being damaged. At one moment my sister came to search for Druid (dog known from my Sky Beauty review), I had closed door in the garden house not to put him in danger. I think he should have profile on LPF as he is laser enthusiast as well as I mentioned it already. I just made my sister aware not to come close to openned part of garden house where the glare could be dangerous. 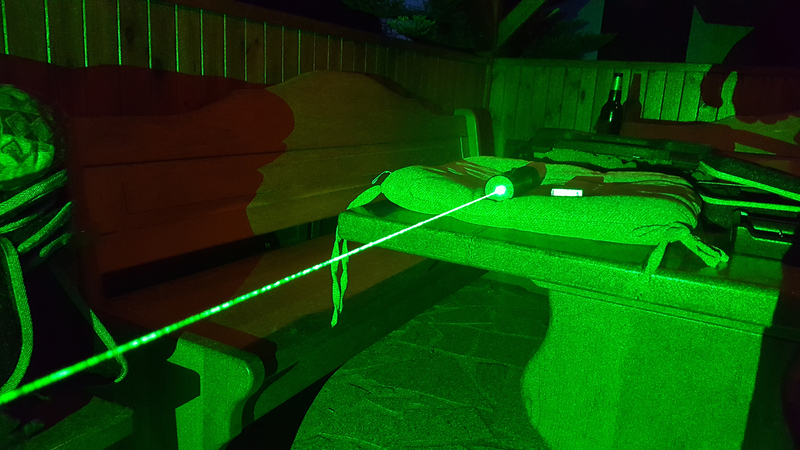 She later came back and tol dme the laser shines in/on the house (in Czech it was not clear if it is in or on), but it illuminated the room, which window (!) was about 15 meters far. Can you imagine it? BTW she asked me if it was safe, I told her not to worry since square distance law apply from the dot. As it was quite a hot day I was surprised that even I runned it a bit longer than the day before, the host was just getting a bit warm. Nothing compared to my Sky Beauty for example. Also I need to find out which temperature is ideal for her as I think I can get much more power from her under lower temperature. Let’s see… I’ll play with her, do some tests, take her for laserpainting and after that I can proceed with a review… Also I need to examine the dot more deeply. A view from top with my Zippo for size comparsion. Pic from day two with various stuff around for size comparsion. Note the key. Here we go! The beam is strong and thin. Blurry part in front is due to camera focus (all pics are taken with mobile, I was worried to damage my camera with such a strong laser). Note the glare and shadows around. All these pics used standard lightbulb and laser as illumination. Note shadows. I did not adjusted the pics just resized them. Here you can see what she does with a match after a few seconds. In deed the match is cut through, just the burned stuff holds it together. I'd love to see a night sky beam shot! Guys, just note it was hot weather and I did not run it long for beam shots - I was worried not to make it too hot. So not only it likely did not reached peak yet, but I think it might go brighter at cooler temperatures. As it is usual with all others DPSS. Edit: For night sky I have to prepare safe environment. Likely after weekend as I'm away from home till then.